Best Cellular is advising on the shut-down of over 100 retail Sprint stores run by Mobile Now (Simply Wireless). What happened to Mobile Now? According to comments from several former Mobile Now employees, the breach of contract with Sprint was some sort of money laundering scheme. Whether that is true or not, whatever went down leaves hundreds of employees jobless and searching. Employee remarks reference their frustration with the lack of notice. The “employee separations” memo went out April 2nd, the day after these changes took effect. The other brands under Simply Wireless appear to be operating normally at this time, unaffected by the Mobile Now shutdown. The company has been around since 1997 and ran over 100 Sprint stores under the Mobile Now brand. According to their LinkedIn profile, the company has in total between 500 and 1,000 employees. Their other brands include Simply Prepaid (a multi-carrier provider), Shop Cell Deals (a dedicated web store for wireless deals), and Wireless Partners (a wireless vendor and distribution partner). What Can You Do If You’re A Mobile Now Employee Who Lost Your Job? American MVNO, Best Cellular invites former employees of Mobile Now to apply for new positions the company is creating as Best Cellular expands, offering new retail locations Nationwide. Best Cellular also has positions available for employees who are skilled writers, social media experts, and bloggers. The Best Cellular affiliate program is another option for former Mobile Now / Simply Wireless employees who are looking to work from home. Former Mobile Now / Simply Wireless store managers have the option to apply to become a Best Cellular store owner. They can open their own self-funded, custom-branded multi-carrier retail location. What Will Happen To Mobile Now Sprint Customers? Best Cellular will be waiving all activation fees to help ease this transition for customers affected by the shutdown of the Mobile Now / Simply Wireless Sprint retail stores. Customers can port their Sprint numbers to Best Cellular service. Mobile Now customers can also use the same Sprint phone and current SIM Card to process the port. “Many people are wrongly blaming Sprint for the Mobile Now shutdown. I’ve worked with a number of the Sprint executives on the wholesale side. I can tell you from experience they’re the easiest to work with out of all 4 major carriers. For further commentary or questions about prepaid wireless, MVNOs, or industry news, contact us at 1-970-549-2378. 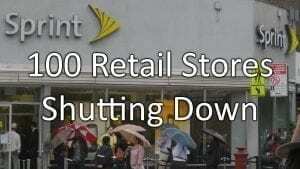 Share "100+ Sprint Stores Shutting Down (Mobile Now)"